The on-again, off-again cease-fire between Israel and Hamas is off, Hamas terrorist sources said Tuesday night. According to Izat a-Rishk, a spokesperson for the Hamas terror government, there would be no cease-fire until Wednesday at the earliest, because Israel had rejected Hamas' conditions for a cease-fire. “All possibilities are open, and our people are ready for all possibilities,” he said, referring to the still-possible Israeli land invasion of Gaza. Tens of thousands of IDF soldiers are reportedly poised to enter Gaza, to carry out objectives on the ground. As talk of the cease-fire faded, the IDF increased its hammering of Gaza terror sites. 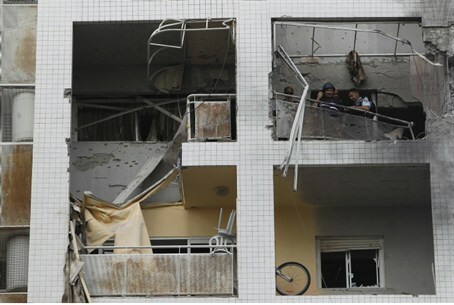 In one raid Tuesday night, IDF planes caused significant damage to the main Hamas government building in Gaza City. Between 9 and 11 PM Tuesday, the IDF carried out more than 50 bombing forays on targets in Gaza. Twenty terrorists were injured. Over 100 targets were destroyed on Tuesday, bringing the total number of targets the IDF destroyed in the six full days of Operation Pillar of Defense to about 1,500. Half of Tuesday's raids were on terrorists preparing to fire missiles at Israel, with the balance hitting smuggling tunnels, arms factories, and rocket-launching sites and equipment.